This morning, it was raining, I didn’t have the car, I was recovering from a 3 day long headache, and Margo was driving me absolutely bananas! Now, every 3 year old has the potential to drive his or her parents crazy on any given day, it’s not like she was being over the top or anything. But, as some friends of mine put it nicely… she has now entered her ‘three-nage‘ year. Like, she’s really really pushing the boundaries as to what is acceptable. Saying ‘No‘ just to say ‘No’ (like, I can see she is doing the pee-pee dance, but still won’t go, even though she’s been potty trained for over two years already!). Then, pouring herself a cup of juice and spilling a bunch on the table… and then a few minutes later, dumping it down the sink because she really wanted rice milk instead. All the while, I’m feeding Goldie on the chair and I can’t get up to help her or even speak too loudly, or else Goldie will get distracted and pull away mid-feed. Margo’s behaviour is not ‘naughty’ or ‘bad’… just the average doings of a three year old. 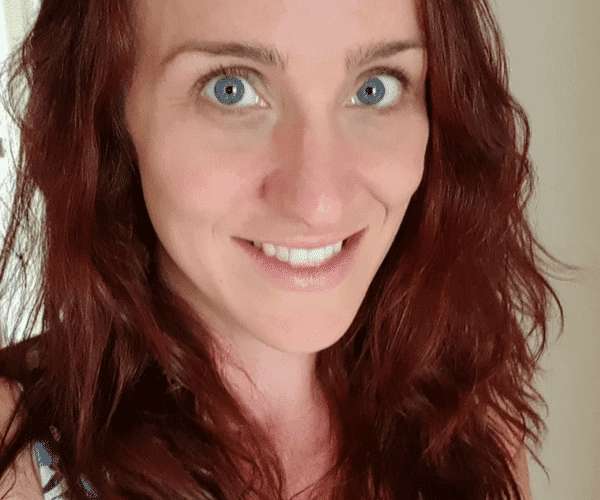 I’ve been reading this book, ‘Raising Our Children, Raising Ourselves‘, by Naomi Aldort… If you ever heard of unschooling, attachment parenting or any other radical parenting ideas… well, Naomi Aldort is at the crux of this stuff. About six months ago, a friend of mine sent me a youtube clip of hers and I just remember being really annoyed by what she said. Anyway, some months later, here I am reading her book, and I have to say, I’m really enjoying it, concidering I haven’t read a book in about… oh… 8 or 9 years! The book is pretty straight-forward about radical parenting. She talks about using language to help understand a child. She talks about how to deal with tantrums and head-butting and she gives many real-life examples that were taken from patients whom she had counseled. The quote on the back of the book says, ’Taking the Struggle out of Parenting‘. Everything she says in the book is really nothing new (even she says so herself), it’s just stuff that you need to remind yourself to do the next time little Johnny tries to wash the dishes by himself and you end up with an olympic size swimming pool on your kitchen floor. Although I haven’t read the whole thing, I think I would recommend it to everyone who has kids, no matter what the age of their children. So, today, I was feeding Goldie and had set Margo up at her little craft table with a dry erase marker and a stencil book. It was an activity that she wanted to do anyway, so I let her go at it. It got awfully quiet over there at that table while I was feeding Goldie… When I got up, Margo had the biggest smile on her face AND black marker ALL OVER HER FACE! Before I said anything, or take any action, I let her talk first. She said, ‘Look mom, I’m a TIGER, ROOOOAR!!!!’. I started cracking up. 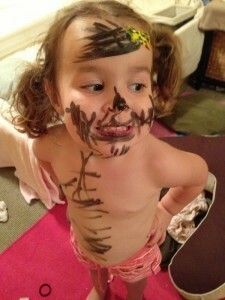 We were about to go for a walk down to the beach, and she had marker EVERYWHERE! I said, ‘Do you want me to help you wash it off?’. She said, ‘No, leave it! I said, ’Ok, we’ll leave it, but people might be looking at you funny, that’s all‘. I probably didn’t have to say that last bit, but I was sort of hoping that she would wash it off, because it was really scaring Goldie. Every time Margo ‘roared‘ at Goldie, Goldie started crying. We were walking down the street, and all the people were in fact, laughing at Margo’s face. Not in a bad way, just they thought it was cute. Oh, did I mention that she also put a bright yellow band-aid on her forehead? Then, a family with three young children were approaching us and all of a sudden, Margo said, ‘I want to walk on the other side of the road!’. ‘Because, I don’t want them to see my face!’, she replied…. Oh wow, I thought! That’s her ego (you know, the thing that separates you and makes you feel self-conscious) ! I don’t think I’ve ever seen it come out yet! Then, I felt bad about saying how everyone would be looking at her funny… I though, wow, was it my words that made her feel like this? Maybe? We didn’t cross the road and we had to walk by the kids. They didn’t really laugh ‘at’ her, but they all had smiles on their faces. I could see Margo was looking a little bit like she wanted to hide. Anyway, we got down to the beach and I asked Margo if she wanted to go swimming because there was a fantastic baby pool. She said, ’YES!’, then TOOK OFF ALL HER CLOTHES, and put on her bathing suit. Here is the girl who was embarrassed that she had marker on her face, but was not even the slightest bit concerned about having her bare bum blowing in the breeze! I guess it goes to show that we, as parents, really can have the biggest impact on our little ones with the words we choose to use. If I had told her that everyone will be looking at her funny if she were naked, would she have felt differently about striping down to put her swimmers on? Jenny DeValentin liked this on Facebook.